Dehydrating vegetables is often depicted as a major chore. The method presented here produces a powder which may be used in methods only limited by the imagination. I have used tomatoes for this example. The process is to beat the selected product into a slurry using a stand up blender or a hand blender. Depending upon the product it may be necessary to add a minimum mount of water, but usually the inherent juices are sufficient. The slurry is then poured into a teflon pan. The pan is greased with a layer of olive oil to prevent sticking. The pan is placed in a dehydrator set to about 135F. Drying takes about 8 hours, but it must be thoroughly dried, brittle is a reasonable test. The partially dried sheet should be lifted from the pan when about half dry to present more surface to the air. When thoroughly dry the sheet is broken into small pieces and pulse blended into a powder. The end product may be reconstituted in a soup or used as a sprinkled condiment. For storage the product is vacuum sealed and stored in the refrigerator or freezer or if absolutely dry at room temperature. Packages make a fine travel food. 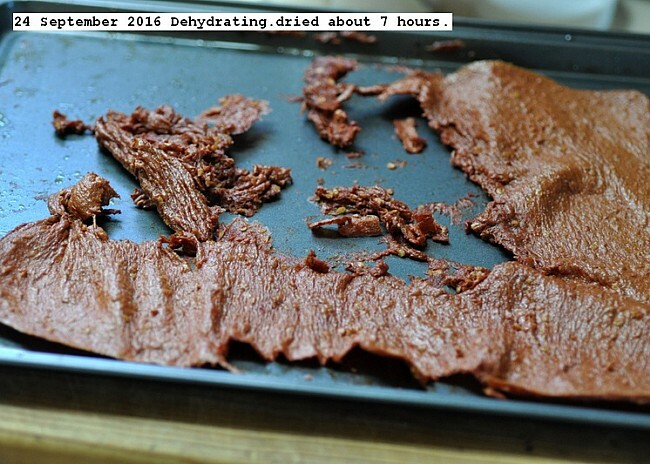 This entry was posted in Uncategorized and tagged 24 September 2016 Dehydrating, 24 September 2016 Dehydrating (Method), Dehydrating (Tomatoes). Bookmark the permalink.